Thank you Greet & Gather for the complimentary box. All opinions are completely my own. The older I get, the more I realize I absolutely would choose a fun night of staying in at our house instead of "hitting the town." Staying in doesn't always mean that I want to be in my jammies and binge Netflix (although that is quite nice a lot of the time!). Often times, I'd love to invite our friends or family over and entertain. Something about enjoying a nice glass of wine with fine cheeses and spreads, surrounded by those you love just feels right. 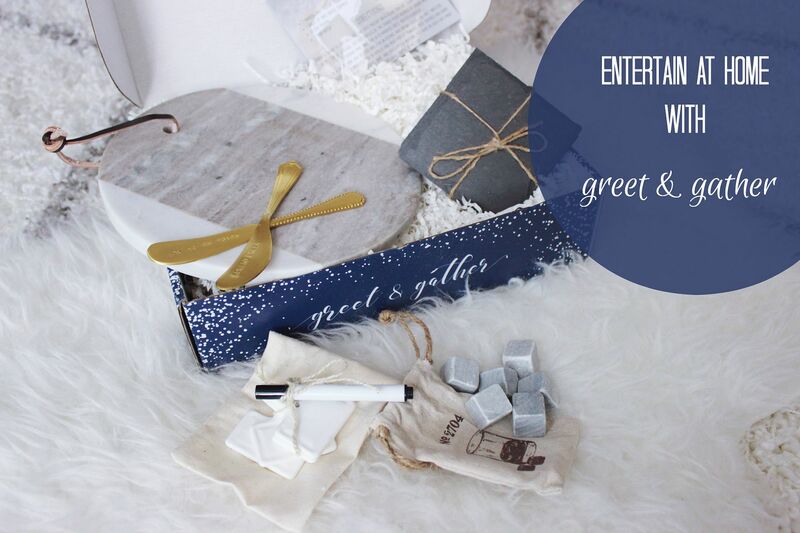 Lucky for us all, there is a brand new subscription box company that can help us entertain like pros! 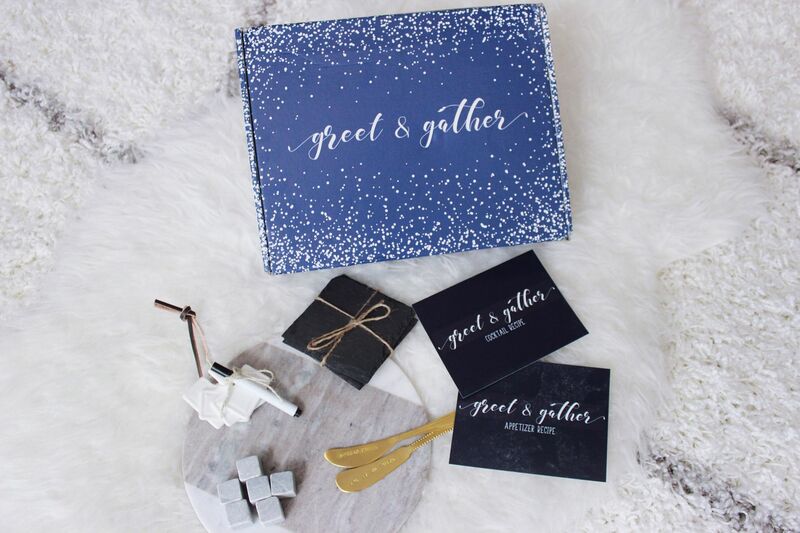 Greet & Gather was specifically created and curated for those who love to entertain. You can sign up to start your monthly subscription and receive a box full of 4-6 items that you can use the next time you host an event in your house. The October box was their very first box and I was blown away when I received everything. The items inside were so gorgeous and unique, unlike anything I currently own in my kitchen. I almost don't feel worthy of receiving the items because everything is so beautiful and elegant. The quality is superb! The pieces came packaged in a gorgeous dark blue box. The color immediately caught my eye as it was extremely chic and inviting. Inside, each item was packed very carefully in a bed full of white paper confetti. I did not fear that anything was damaged in transit as each item was carefully wrapped and given appropriate padding. I particularly loved the Glacier Rock Cooling Stones. These are stones that you freeze and then use in your drink to chill the beverage without having to worry about the drink getting watered down. I've never used anything like this item, but I found it very intriguing and practical. My husband does not like his drinks to be watered down by melting ice, so this is the perfect item for him. 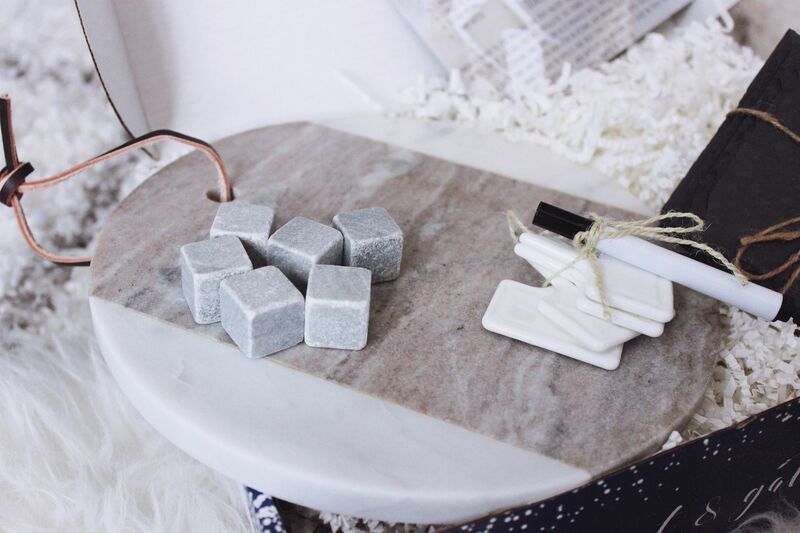 The Marble Cheese Board is gorgeous; the pictures below don't even do it justice. 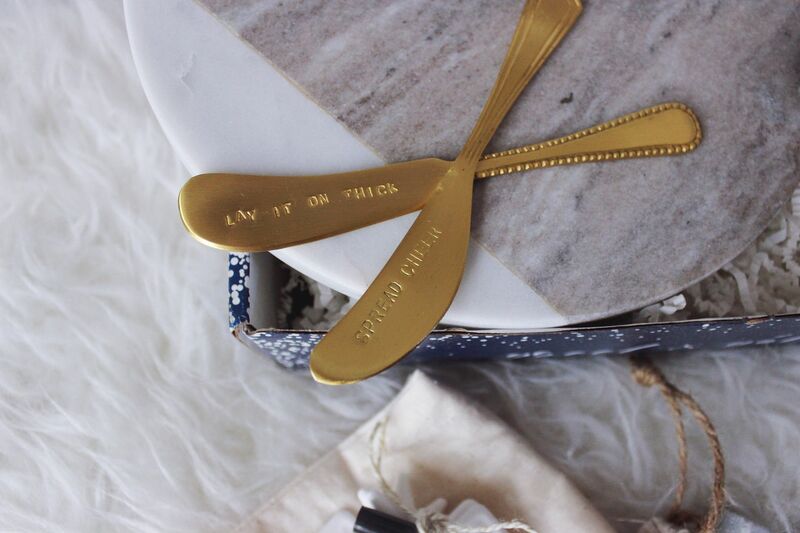 I cannot wait to have a girls' night and serve all sorts of cheeses on that marble board. And finally, I must call attention to the Brass Spreading Knives. They are engraved with the phrases "Spread Cheer" and "Lay it on thick." I think the engraving could be a terrific conversation starter for a dinner party. 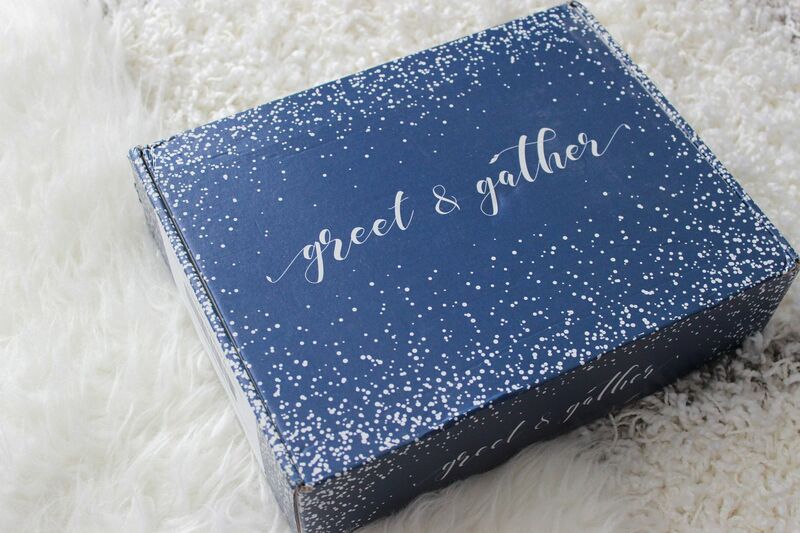 What I love about the October Greet & Gather box is that everything inside is very practical and will get used during a dinner party, yet they are items I would not normally buy for myself. Which is what makes receiving the subscription box so fun; you are introduced to items outside of the normal realm of kitchen gadgets and realize that you need them for excellent entertaining. I expected the box to be fun to open as most subscription boxes are, but my expectations were completely exceeded. I was extremely pleased with every piece and felt like a lot of care and expert pairing went into selecting such elegant pieces. Each month will feature a different theme, so you know you will always receive boxes with unique items. Would you like to get your own box? I certainly can't wait to see what the November box includes!!! If you use code PursuitOfPink when ordering you will receive 10% off your first box if you choose a subscription. The code is also good for 10% off any of the pre-paid options as well (which already have great savings, so this is in addition!). The boxes are extremely affordable for everything that comes inside. One month costs $39.99 yet the October box had a value of over $85. You receive some incredible savings on entertaining supplies, that is for sure! 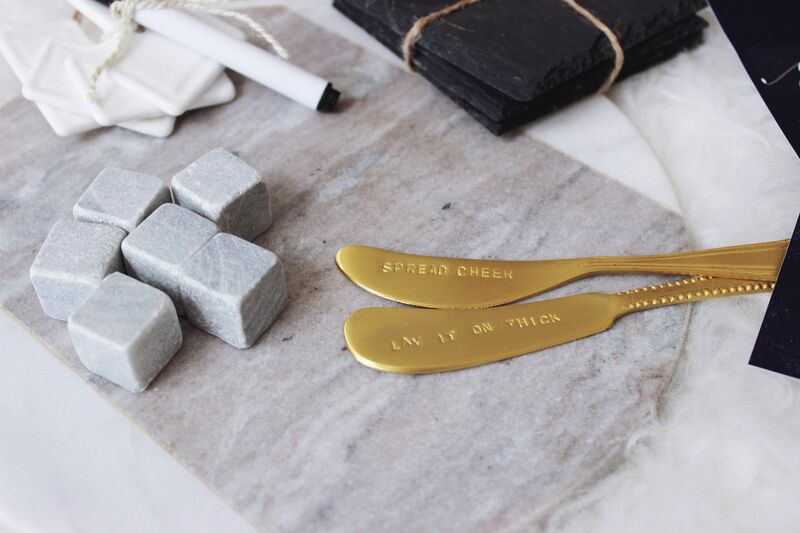 Greet & Gather is perfect to give the foodie in your life as well as the person who loves entertaining. It is a perfect gift for both men and women. 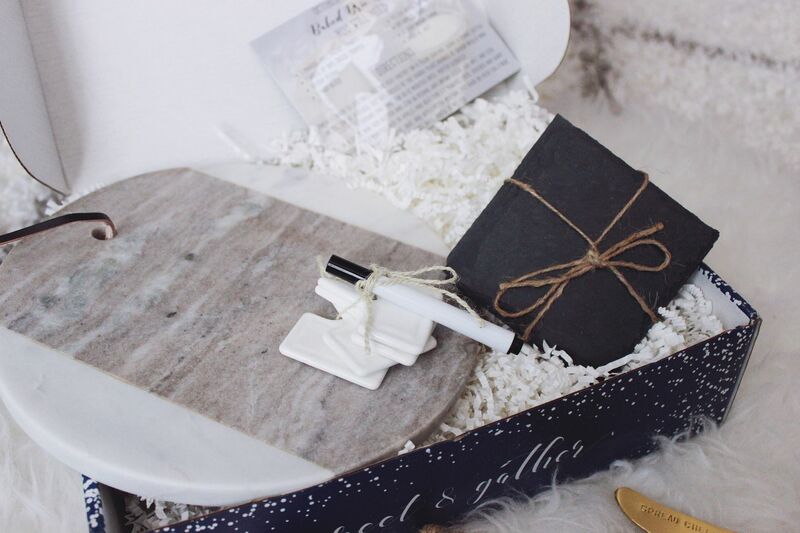 Unlike other subscription boxes, I think this is very unique and will be an extremely thoughtful gift that people will most certainly appreciate receiving.